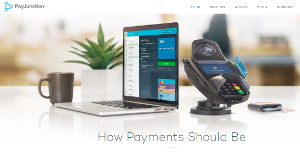 PayJunction is a payment gateway management solution that powers small, medium, and large-scale businesses with modern payment features such as smart payment processing, electronic signature capturing, and comprehensive multi-user multi-location reporting that makes for an empowered and easy payment system for businesses around the world. Touted as the leading developer of paperless payment software, PayJunction has developed technology that is brilliant in its design and engineering, and which has eliminated the traditional method of storing paper receipts, ultimately helping increase productivity and reduce costs for small and medium sized businesses and, more importantly, helping the carbon footprint of an entire industry. PayJunction transforms any web browser into a virtual terminal the business can utilize for its needs. It also eliminates the need to store signed paper receipts as everything is stored in a secure online environment. At the same time, it offers green technology with everything done online, even in sending receipts by sending them via email. At the same time, every transaction being run in the system is saved there for the lifetime of the business. For qualified businesses, PayJunction will provide a Smart Terminal which provides businesses with many options for accepting payments, including all major credit cards, checks, NFC-ready phones, and even the Apple Watch. This EMV-ready terminal will reduce the liability for fraudulent transactions and keep you up to date with payment-processing requirements. Its comprehensive reporting makes sense of all transactions made and provides insight into how the business is developing. The system also offers the capability for electronic signatures that provide convenience, eliminate the need for paper receipts and protect your business from charge-backs and fraud. Users can even can capture remote signatures for card-not-present transactions by texting or emailing a receipt to your customer, who can then sign it using any mobile device, platform, or browser. If you are interested in PayJunction it might also be a good idea to analyze other subcategories of Best Payment Gateway listed in our database of B2B software reviews. There are trendy and widely used solutions in each software category. But are they necessarily the best fit for your company’s unique needs? A popular software application may have thousands of subscribers, but does it present what you need? For this reason, do not blindly invest in popular systems. Read at least a few PayJunction reviews and think about the aspects that you wish to have in the software such as the fees, main features, available integrations etc. Then, choose a few solutions that fit your needs. Check out the free trials of these products, read online reviews, get explanations from the vendor, and do your investigation meticulously. This exhaustive homework is certain to help you select the finest software platform for your organization’s unique requirements. How Much Does PayJunction Cost? We realize that when you make a decision to buy Payment Gateway it’s important not only to see how experts evaluate it in their reviews, but also to find out if the real people and companies that buy it are actually satisfied with the product. That’s why we’ve created our behavior-based Customer Satisfaction Algorithm™ that gathers customer reviews, comments and PayJunction reviews across a wide range of social media sites. The data is then presented in an easy to digest form showing how many people had positive and negative experience with PayJunction. With that information at hand you should be equipped to make an informed buying decision that you won’t regret. What are PayJunction pricing details? What integrations are available for PayJunction?